Never has there ever been this much elegance in a table clock. The Joyful Crystal Bells is wrapped in a beautiful faux wood like case and accented by gold colored elements. 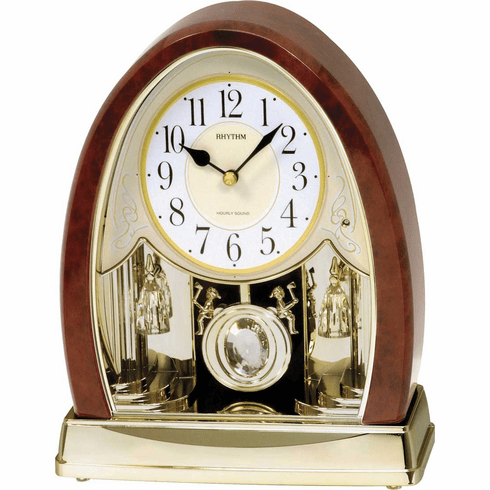 The eye-catching pendulum swinging gives this clock character. It plays 12 melodies with 6 of them being Hymns. This clock also comes equipped with a night sensor, volume control and is battery quartz operated. Hand assembled. Quartz clock movements ensure reliability and trouble-free service. Requires 2 "C" batteries (included). One year warranty.